Handheld version adds new scenarios, visuals, and voiced protagonist. Another day, another PS Vita adventure game announcement. 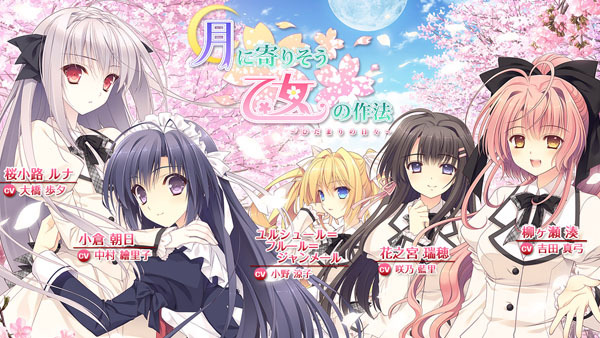 HuneX is bringing Navel’s Tsuki ni Yorisou Otome no Sahou to the handheld in Japan later this year. The PS Vita version will have new scenarios by the original release’s staff, as well as new visuals, touchscreen support, and a fully-voiced protagonist (Asahi Kokura). Coming from a prestigious family, that didnt want him, in the financial world, Yuusei had been home-schooled strictly and sheltered all his life. Even though he excelled at everything, it was his dream to live a life of a commoner. One day his chance came and he changed his identity to Asahi and entered Fairy Girl’s School, which specializes in female fashion for the rich. As part of his plan, he became the maid of his classmate Luna and worked at her home Sakura-yashiki. Also living there were a proud exchange student from Switzerland, Ursule, a Yamato Nadeshiko, Mizuho, and his childhood Minato, who had feelings for him and was also the only one who knew his true identity. With her help, will he be able to manage his double life in the school and his new home?